She decides to return to Mehta house with her daughters. Sanjay’s father is very happy to see Shruti and her daughters but this doesn’t go well with Prabhadevi. Baa starts staying with her other son. Shruti promises to herself and to Sanjay that this time she will do everything to win the hearts of all the members of Mehta house including Prabhadevi. She further requests Sanjay that their relationship as husband-wife will progress only after the family members accept her as the ‘bahu’ of their house. Sanjay promises to be with her on every step. Aami n Khushboo try to adjust themselves with their cousin Trisha. Next morning Shruti starts her day by performing puja and aarti. She tries to make different and delicious breakfast for all but Prabhadevi does not allow her from doing so. She informs Shruti that Mehta house follows a fixed menu and if she wants to change it she needs to discuss it with her beforehand. She can change it only with her permission. Shruti feels bit bad and uncomfortable. Sanjay’s father tries to comfort her . To make the situation light he refers Mehta house a ‘Hostel’ and Prabhadevi as the ‘Matron’ . This makes Prabhadevi furious and she creates a huge scene of this. She tries to handover ‘ghar ki chabi’ to Shruti and insults her to the core by blaming that Shruti only wants to take the control of the house. She wants her position. Shruti returns the keys to Prabhadevi and tries to convince her the all she wants is acceptance and blessings not anything else. Parul,the elder daughter-in-law of Prabhadevi , gets tense..as she wants those ‘chabiyan’ . Being the elder daughter-in-law she thinks she has the right to enjoy the supreme power of the house. She tries to take the keys but fails..Prabhadevi, keeps the keys with her. Amidst of all these, Mr.Mehta(Sanjay) and Mrs.Mehta(Shruti) spends some sweet romantic moments with each other. Sanjay wants Shruti back in office but Shruti wants to concentrate on her household duties. She applies for few days leave which Sanjay approves. Their bonding has become more strong because of the mutual love & respect they have for each other. Constant misbehavior of Prabhadevi with Shruti irritates Aami a lot. To teach her a lesson,Aami mixes glue in Prabhadevi’s mehndi. She applies the paste on her hair and her hair becomes stiff ‘n’ sticky ,looks peculiar. Everybody laughs on seeing her screaming with disappointment. Aami gets huge satisfaction on doing this but Khushboo fears for another storm. Next day Shruti prepares breakfast as per Prabhadevi’s menu. Her ‘Dosa’ becomes a big hit . Family members appreciates her a lot..including her elder sister-in-law Parul. Unable to digest this, Prabha devi applies the age old strategy of ‘Divide and rule’. She appreciates Shruti to make Parul jealous. This works well and Parul feels extremely envious of Shruti. Parul jealousy gives Prabhadevi satisfaction and boosts up her so called ego. In the mean while, Prabhadevi comes to know that Aami mixed glue in her mehndi. She promises to teach her a lesson. Sanjay , who’s very happy with Shruti’s success..sends her a bouquet n a card. Prabhadevi receives this from the delivery man. She can’t tolerate Sanjay’s love and appreciation for Shruti. In her anger, she destroys the bouquet and puts the blame on Aami. She protests against this blame very rudely and calls Prabhadevi “Jhoothi” and argues with her a lot. This triggers a huge unrest in the family. Prabhadevi refuses to hear anything unless Aami begs pardon . On the other hand, Aami refuses to say sorry as she has not done any wrong. Ultimately Shruti manages to make Aami understand the situation . She for her mother’s sake says sorry to Prabhadevi but her hatred for her increases further. Sanjay supports Shruti in solving this problem and is always with her in all her decisions. He even protects Aami from his mother’s anger. 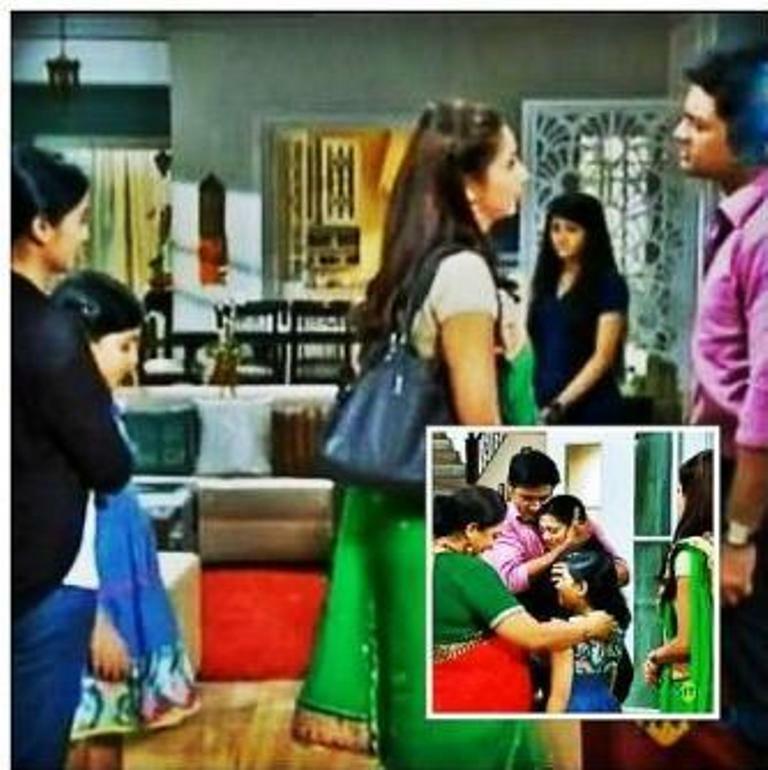 Prabhadevi’s daughter Riddhi leaves her husband’s house and comes to stay in Mehta house. Now, together they plan to harass Aami to create distance between Sanjay & Shruti. Prabhadevi claims Aami to be the weakest link between Sanjay and Shruti …so to break their relationship…she needs to break Aami. Shruti goes to her mother’s house and in her absence Prabhadevi and Riddhi , with Trisha’s help frame Aami . Make fun of her in front of Trisha’s friends . 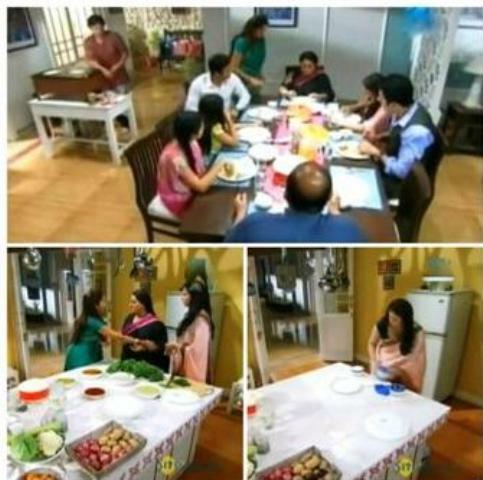 Riddhi then plans to harass Aami more by adding castor oil in Trisha’s friends food. Khelti Hai Zindagi, Aankh Micholi – Updated : 29 November 2013. Episodes..18th Nov to 22nd Nov. and 25th Nov. to 29th Nov.
Shruti conceals her emotion and leaves the place quietly. But Sanjay overhears his mother’s words and decides to leave for U.S.A. for a job without marrying Bhavna. He clearly states that ..If his mother is not ready to understand his emotions, his love for Shruti, then why should he stay back..! He further adds he can stay back only one condition..if his mother requests Shruti to marry Sanjay and give her blessings to Shruti. To win back Sanjay…Prabhadevi agrees, goes to Shruti’s house and blesses her with their ‘Khaandani Kangan’. Shruti is surprised to see Prabhadevi’s changed behavior. Although she keeps the kangan but fails to take the decision of marrying Sanjay immediately. Ami is still against this marriage but Kumkumji, Shruti’s mother makes her understand the situation…Ami reluctantly agrees for her mother’s marriage to Sanjay. Kumkumji…along with Baa, ultimately manages to convince Shruti to say ‘Yes’ to Sanjay. Shruti reaches the marriage venue where Sanjay is still waiting for her reply. True Love breaks all the barriers ‘n’ Sanjay-Shruti unites. Sanjay becomes speechless when he sees Shruti in Dulhan’s attire..It’s the ‘dream come true’ moment for him..he says overwhelmingly ….”Dekhna chahta hu jagte huye mera sapna kaise dikhta hai…” . Sharing their happiness, they spends some sweet moments with each other. Finally ‘Dulha-Dulhan’ arrives at the mandap –after ‘Kanyadaan’ by Baa..they takes pheras. Sanjay not only accepts Shruti as his wife but also accepts fatherhood when he takes Khusboo with them for the last few pheras. Indeed a strong decision and a lovely scene. Sanjay Mehta is now a happy man..’his Shruti’ has become his wife and his two best friends, Amy n Khushboo, are his children. Khushboo is very happy and readily accepts Sanjay as her ‘papa’ but Ami who’s still very sensitive about his father Harsh refuses to accept Sanjay as his father. Sanjay deals the issue with love n care and asks Amy to accept him as her friend only if not as her father. He further relieves Shruti from her worry regarding Baa by taking her with them to their house. Sanjay-Shruti..along with their daughters n Baa reaches ‘Mehta Residence’ for ‘Grihapravesh’. Except Sanjay’s father, Yogesh(Sanjay’s bro-in-law) ‘n’ Shani… Mehta parivar is not at all happy with this marriage and baa’s inclusion in their house annoy them further. Shruti feels fortunate to have Sanjay in her life…Sanjay says that when he decided to marry Shruti, he accepted her with all her responsibilities. Sanjay-Shruti feel complete with each other…their trust ‘n’ love for each other has brought them together and has blessed them with happiness. Prabhadevi who’s very unhappy with this marriage plays her move and successfully bitters Shruti’s mind by informing her that Sanjay has emotionally blackmailed her to give permission for their marriage. Shruti is shocked to know this fact & it damages her relationship with Sanjay on the first night itself. Sanjay tries to justify his point of view..but Shruti refuses to accept it. She further feels humiliated and insulted when on every step she faces ignorance from her mother-in-law and others. Baa and her daughters also face hatred of the family members. Huge misunderstanding comes between Sanjay-Shruti. For the time being…Prabhadevi succeeds in ruining their relationship, from Shruti’s perspective. Will Sanjay win back Shruti’s faith once again? Will Mehta family accept Baa n Shruti’s daughters? Will Prabhadevi spit more venom ? Stay tuned to ZeeTV to catch latest episodes of Khelti Hai Zindagi Aankh Micholi at 10pm…Monday to Friday ..
Khelti Hai Zindagi, Aankh Micholi – Updated : 17 November 2013. 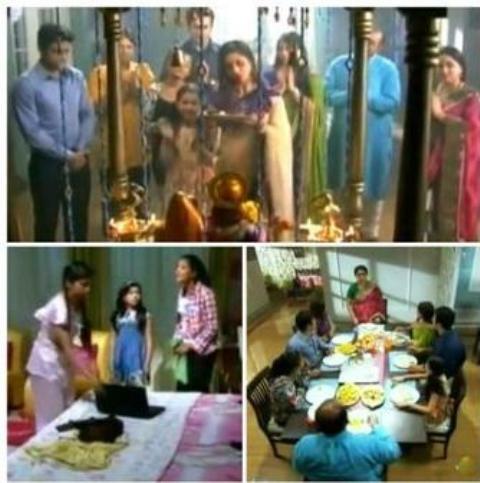 Episodes..4th Nov to 8th Nov. and 11th Nov. to 15th Nov.
Mehta family is going through a major crisis as their son-in-law Yogesh, gets arrested in a passport fraud case, with little proof of his innocence. This worried Sanjay. Shruti, unaware of Sanjay’s problem, senses something amiss but hesitates asking him. The news gets flashed in newspaper and Shruti is shocked to know about it. She contacts Sanjay’s lawyer and decides to give witness in favour of Sanjay’s brother in law Yogesh. Shruti sticks to her decision …”Tumhe paresan nehi dekh sakti hu main kyunki….. tum meri best friend ho Sanjay..” was her retort. Best Friend yani ‘Sabse acche Dost’….I remember a very famous line from a movie… “Pyar Dosti hai..”..
Sach mein..woh Dosti hi toh hai jo Pyar k neev ko itna mazboot banata hai k woh haar mushkil ka samna kar sake..haar seema ko par kar sake…bina sart ke, ek dusre ka sath nibha sake. Mehta family is happy for her selfless act, but Prabhadevi, Sanjay’s mother, is not happy with Shruti. She finalizes Sanjay’s engagement with Bhavna which irritates Sanjay a lot and he declares his decision of marrying Shruti in front of all family members. Everyone except Sanjay’s father is shocked and is against his decision. Sanjay’s mother meets Shruti and insults her to the core. She repeatedly mentions that Shruti is a widow and has two grown up daughters…her presence in Sanjay’s life will ruin his life. Sanjay who’s little unsure about Shruti’s feelings, by chance meets Shruti’s mother in her absence. Shruti’s mother blesses him for giving her daughter a second chance in life and also ensures Sanjay that Shruti also loves him but is unable to accept the fact. The mother..the daughter-in-law within her stops her from accepting her love for Sanjay. Sanjay feels happy and relieved. On Diwali, Sanjay comes to Shruti’s house to wish them. Shruti is alone in the house and Sanjay gets a chance to express his love and also requests Shruti repeatedly to accept the fact that she also loves him equally. Shruti’s responsibilities as a mother..as a daughter…more over Sanjay’s mother’s words stops her from accepting her love. For a while…Sanjay loses his patience and forces Shruti to speak out, but relents, realizes his mistake and repents for his behavior. Pyar ko zabardasti se kab kisne hasil kar paya hai.. He leaves Shruti’s house silently. Shruti..who controlled her emotion in front of Sanjay breaks down …she can lie to everyone but how can she lie to herself..!How can she deny that she also loves Sanjay very much..she also want him in her life..
But…a mother..is always a mother first then a woman..she can never think about her own happiness at the cost of her children’s happiness. Sanjay gives a nod to his mother’s decision and Mehta family goes ahead with Sanjay & Bhavna’s engagement ceremony. Initially Shruti avoids the ceremony but destiny brings her in front of Sanjay. Sanjay who loves Shruti immensely places the engagement ring in Shruti’s finger instead of Bhavna, pleading her to admit her feelings. This unexpected act of Sanjay shocks Shruti and leaves all others stunned. Ami gets furious on learning that Shruti loves Sanjay. She feels that Shruti is betraying her late father and Shruti’s husband and runs away from the venue. She can’t think of anyone in her father’s place. Shruti assures Amy that she’ll never marry Sanjay and for her children’s happiness she returns the ring to Sanjay. She further requests Sanjay to marry Bhavna if he has ever loved her. Sanjay apologizes to Bhavna’s family and also to Hoshipura family. He agrees to get married to Bhavna but at the same time he believes in his love and also has full faith on Shruti’s love for him.He…with full confidence says to Shruti…. “…Tum khud aayogi mujhe iss shadi karne se rokne k liye..yeh mera yakeen bhi hai aur chunauti bhi…”. Will Shruti admit her love for Sanjay? Will she come to stop Sanjay from marrying Bhavna? Will Amy accept Sanjay as her father ? Wonderful screenplay of Sonal Ganatra…Mind blowing dialogues of Rajesh Soni and Fantastic performances of Manav Gohil as ‘Sanjay’ n Gautami Kapoor as ‘Shruti’ make the show watch worthy. Stay tuned to ZeeTV..Monday to Friday at 10pm to catch the latest episodes of ‘Khelti Hai Zindagi Aankh Micholi’. For weekly updates visit our Blog…Happenstance…Serendipity of happy discoveries. Khelti hai zindagi aankh micholi, the new show of Zee TV at 10pm (Monday to Friday) is a touching story of a young widow Shruti Joshipura (Gautami Kapoor) and her two daughters…Amy (Ulka Gupta) and Khushboo (Reem A Sheikh). The story revolves around these three characters and their struggle to find a foothold after the death of Harsh Joshipura (Vinay Jain), Shruti’s husband, in an accident. After Harsh’s death, it was Sanjay Mehta’s (Manav Gohil) constant support that helped Shruti and the girls pull through the trauma, the girls finding a father figure in him. Harsh Joshipura was a perfect family man, Shruti’s soulmate, a friend, philosopher and guide to Amy and a perfect son to Baa (Farida Dadi). His untimely death two years back created a vacuum in Joshipura family which is yet to be filled. Amy, a teenager is lost and confused and finds it hard to move on without her father, who she adored. For Amy her father was the best man on earth. She is unable to focus on studies and has fallen into bad company at school. Quite often her misgivings have proved challenging to her mother. Sanjay Mehta is a decent, caring,matured ‘n’a selfless man. Although he belongs to an eminent business family of Baroda, he has not joined their family business, instead runs a partnership company. When Shruti loses her job, Sanjay requests her to join him which she does hesitantly. He makes it a point that he does everything to keep Shruti and family happy. This said, his mother Prabha Devi (Soma Anand) dislikes their friendship and wants Sanjay to settle down with a girl of her choice. Sanjay rejects all the alliances his mother brings for him enraging his mother further. In the process he also realizes he loves Shruti and takes courage to propose to her. They say ”Pyar jab hona hota hai..toh baas ho jata hai.”. How true. Enraged at this sudden turn of events, Shruti decides to quit her job with Sanjay and break all ties with him. Hoshipura family faces a new crisis when their landlady serves them a notice to vacate the house they were staying in a month’s time. The entire family, especially Amy is very attached to the house because she feels her late father’s presence in everything around. The Mehta family is also going through a major crisis as their son-in-law is arrested in a passport fraud case. Having quit, Shruti is serving her month long notice period trying her best to remain normal. Sanjay tries to maintain a distance with Shruti and starts treating her like an employee. This hurts Shruti a lot, …..she feels humiliated when Sanjay shouts on her for a genuine mistake she commits. Unable to bear the dilemma, she breaks down wondering what made her lose a good friend forever. Sanjay tries to console her, makes her understand that he loves her very much and will love her forever. ”Ristein badal rahe hai Shruti…ristein badal chukke hai…” he tells her…. but Shruti is unable to accept this change in Sanjay. Shruti’s mother, who’s aware of Sanjay’s proposal, tries to convince Shruti to give life a second chance. Will she accept Sanjay’s love? Shruti’s concern for Sanjay..Is it love or just friendship ? Will Amy accept Sanjay as her father….??? Badaalte Ristein kya baadlav lata hai Shruti- Sanjay aur unn dono k parivaar walon k jeevan mein…..Dekhne k liye..Stay tuned to Zee TV..Monday to Friday, 10 PM.